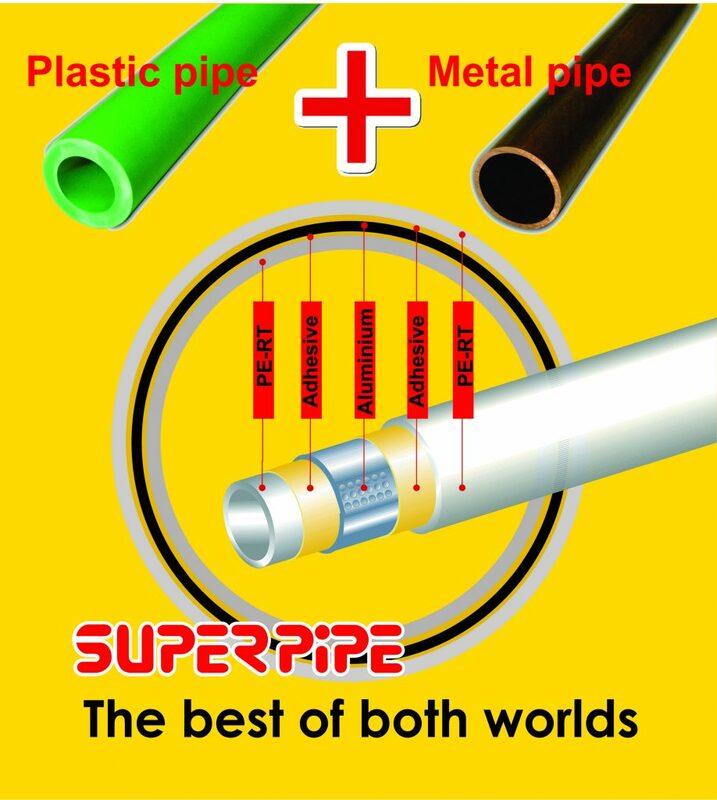 SuperPipe is the unification of the positive material properties of both plastic and metal. With intelligently integrated metal and plastic layers, SuperPipe overcomes many of the problems associated with conventional pipes and can achieve a performance above all traditional plumbing systems. The life span of over 50 years in maximum 95°C with a 10 bar pressure rate ensures a virtually maintenance free installation for years to come. The special polyethylene outer layer is resistant to corrosion and incrustation. The inner layer prevents furring and scale build-up while delivering low friction resistance for highly efficient flow rates. Unlike plastic pipes, SuperPipe has a small heat expansion similar to copper, thanks to its aluminum layer. The layer of aluminum means that the pipe is also totally impermeable and oxygen ingression is eliminated. Because of the temperature retention properties, the outside temperature of SuperPipe is much lower than metal pipes and the “return” temperature is closer to the “flow”. While this is a cost saving feature because less energy will be used by the boiler, it also means that SuperPipe will have lower surface temperature and is safer to touch. For your added convenience SuperPipe is silent and virtually eliminates the noises in heating systems which is usually a problem of poor design. 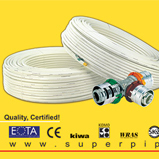 SuperPipe offers a comprehensive range of fittings with the same quality standards. All fittings are made of heat-treated, stress-free brass. Fittings are tin-plated and are resistant to wear, tear and scale build-up. SuperPipe compression fittings program offers a flexible system with fewer parts. Press fittings on the other hand, can be installed faster, easier, and are cheaper. 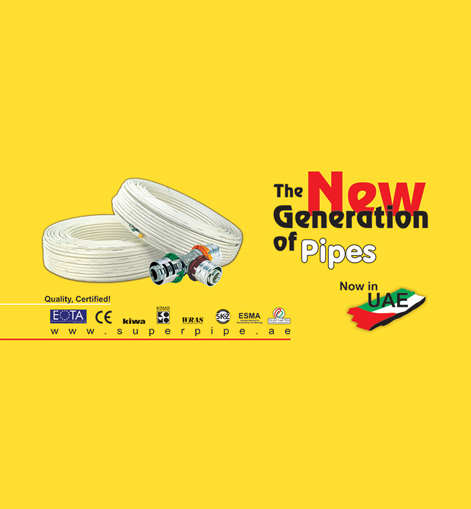 No matter which type you use, all the fittings are designed to perfectly fit the pipe for a permanent tight connection for a lifetime even in concealed installations. Fast, Easy, Safe and Clean. SuperPipe not only opens up new horizons in performance, but also sets new standards in installation techniques. SuperPipe comes in coils, resulting in economical storage. 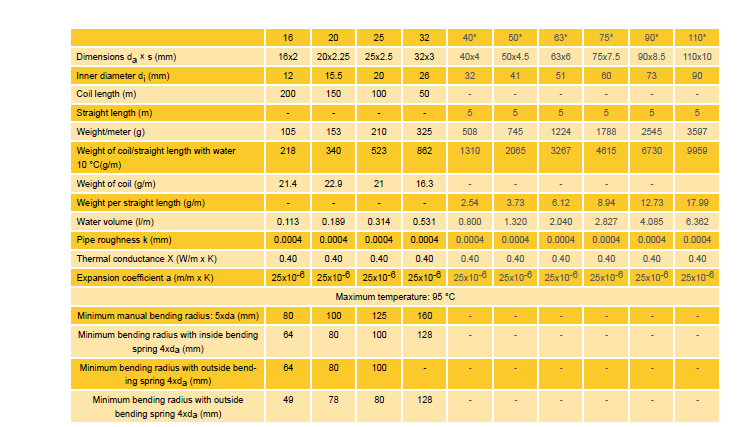 It is also light to carry: a 200 meter coil of SuperPipe weighs only 20kgs. Only a few tools are required for installation of SuperPipe. 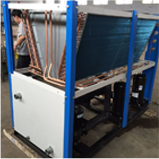 There is no need for welding, brazing or threading. 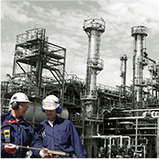 No chemicals or compounds are used, and lack of fluxes, solders and lubricants means cleaner installations. Installation is made even easier because in spite of its mechanical strength, SuperPipe can be easily bent by hand and will retain the desired shape with no spring back effect. With SuperPipe you will get flexibility, formstability, and the ability to have long runs straight from the coil. This means up to 40% less fittings and an installation time saving of over 80 to 40% compared with traditional methods. To these, should be added the elimination of pipe waste and there would be a neat and professional installation with overall reduction of costs. Compared to tap water installation or radiator connection with copper or rigid plastic pipes like PP and PVC, SuperPipe multilayer composite pipe offers a whole bundle of advantages. Cut, insert, press. It is a matter of seconds. SuperPipe press fittings are not only fast, but also come with a range of smart features which virtually eliminate human errors during installation. Integrated window to check correct insertion of the pipe into the fitting. Color code for easy recognition of sizes onsite or in warehouse. 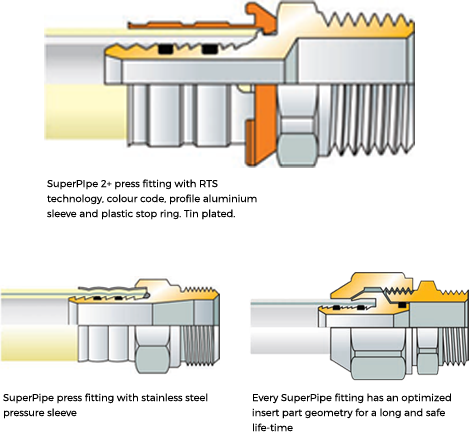 Special jaw guide grooves as well as a stop ring ensures correct placement of the press jaw. Cut, insert, screw. No special tools are needed. Maximum flexibility with minimum number of parts. SuperPipe compression fittings are available for up to size 32 mm. An insert with outer pressure casing is compressed onto the pipe end by firm tightening of the swivel nut. Two o-rings are used to secure the sealing. There is no welding, soldering or thread-cutting.